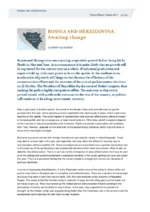 Bosnia and Herzegovina was enjoying respectable growth before being hit by floods in May and June. As a consequence, it is quite likely that no growth will be registered for the current year as a whole. If industrial production and exports hold up, risks may prove to be on the upside. In the medium term, acceleration of growth will hinge on two factors: the efficiency of the reconstruction efforts and the outcome of the crucial parliamentary elections on 12 October. The President of Republika Srpska secured Putin’s support, thus making the polls a highly competitive affair. The outcome in that entity proved mixed, with predictable outcomes in the rest of the country, so politics will continue to be a drag on economic recovery.